The P-N cycle suggests that life must be a case of converting the gifts or prasaadam given to us by God into offerings to God or naivedyam. A corollary to this is the concept of Trusteeship. The Sri Sathya Sai Medical Trust, like many other such entities, receives donations and utilizes them for running Swami’s Hospitals. The Trust is, of course, managed by a duly nominated group of Trustees. The world is full of such Trusts, sometimes called Foundations, and in each case, its members look after the properties and assets of the Trust and manage it such that its objectives are properly and satisfactorily fulfilled. The important point is that every Trustee does not ever act like an owner but as a responsible servant serving the public in a manner intended by the Founder or Founders of the Trust. The service the Trustee renders is always supposed to be selfless. Society is like the Trust, God is the Founder of the Trust and as members of society, each one of us is supposed to be a Trustee, acting for and on behalf of God. Many organs link together to form a system, the examples of which include the respiratory system, the digestive system, circulatory system and so on. In a healthy human body, the systems do not function arbitrarily or in a disjointed fashion. Rather, they work in perfect harmony and synergy. For example, when a person runs, the heart pumps faster and blood is circulated more rapidly, to the muscles of the legs particularly. Similarly, after a heavy meal, blood circulation to the brain is reduced because more blood has to be diverted to the stomach to deal with digestion. In fact, that is why one tends to feel a bit sleepy after a heavy meal! In short, this is the case for one and all. The cells work harmoniously through the organs and various systems to keep the body going, and the body for its part takes care of the organs and cells. It is this symbiosis that enables the body to be healthy. Through its actions, the body is sending us a strong message as to how we ought to manage society? Swami points out that there is a very good one-to-one correspondence between the human body and the society. If the cell is the basic unit of the body, the individual human being is similarly the basic unit of society or humanity. 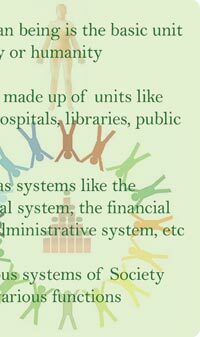 Just as the body has organs, society too has units like schools, hospitals and so on, each of which is an entity given shape by the people associated with it or working for or managing it. 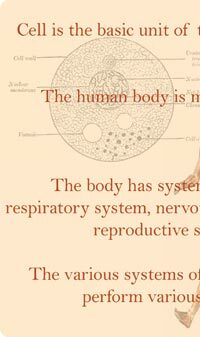 The body has systems like the respiratory system; so does society, with systems like the educational system, the financial system and so on. 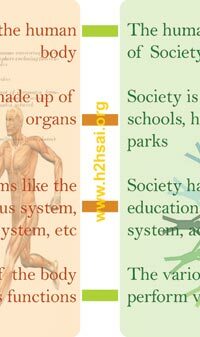 The various organs of the body perform various functions; so do the various systems of society. The human body and human society therefore have strong parallels. While it is fairly common to find people healthy, these days, society is far from healthy. Why does a society become sick? Just as the body is ill when its organs don’t function well, society becomes sick when the systems of which it is made start malfunctioning. Consider for example, public administration. This, you would agree, is one of the vital systems that form a part of society. Suppose the public administrative system is highly corrupt, as is often the case these days in more than a few countries. We would then say that the system is sick, and when you have a diseased system what can you expect but a hoard of problems? Taking a very quick glimpse at the evolution of early systems in human society, we can go back in time to the period when man first appeared on earth. Not only was he quite primitive but in those far-off days, man also lived almost entirely by himself. If he wanted food, he had to hunt for it. If he felt thirsty, he had to go in search of water. If he wanted shelter, he looked for a tree or a cave, just as animals do even now. Humans however were blessed by God with enormous intelligence. They rapidly developed methods of using the gifts of Nature to meet their various needs. As an important part of this process of advancing and improving their lives, people learnt to come together with other human beings and form associations of various kinds. First there was the family, then the tribe, the community, followed later by countries, nation states and so on. Today, we have gone even further by having many international bodies from the UN to the WHO. The gradual growth of complexity in human society thus became inevitable. With this growth of diversity and complexity came first the division of labour and then organisation of society into various functional sectors. Simultaneously, where living species are concerned, they too have gone up the ladder of complexity. To start with, living forms were quite elementary, just unicellular organisms. In due course, these beings became increasing complex, acquired various senses and organs, and so forth. For instance, some of the primitive living forms could not see; it was only later that creatures acquired nose, eyes, ears, etc. The complexity in human society led to the emergence of different sectors like the farming, manufacturing, trading, and banking sectors. And this precisely is where all the trouble slowly started. The various sectors of human society are like the different systems of the human body. However, whereas in the human body the different sub-systems and systems work in perfect harmony, in human society, this is what is precisely lacking because each sector works for its own advantage. Sometime ago, the U.S. Government, in order to please its national steel industry, hiked the customs duty on steel imported from overseas. This of course delighted the steel industry in America but the automakers in that country were far from happy. Already, they were facing stiff competition from automobiles imported from Japan, Korea, etc., and now, thanks to the hike in import duty, they were forced to buy local steel, that is steel made in America, which was expensive. This greatly enhanced the cost of American cars, making them even more unattractive to prospective buyers. It is not therefore unusual for different sectors to clash with each other as each sector is driven by its own agenda and priorities. In general, the greater the complexity, the higher the pull and push between the different sectors. It may be pointed out that such tensions are inevitable since each sector would like to get the maximum advantage for itself from society. Maybe so but what happens when conflicts snowball to the point of being a threat to the whole of humanity? Whether you like it or not, we are rapidly reaching that state. Let us take the case of global warming that is very much in the news these days. Mankind is spewing out every year, millions of tons of carbon dioxide into the atmosphere, most of this coming from the burning of what are called fossil fuels. Coal and oil form the two major components of these fuels. People no longer burn coal for cooking or heating houses as they once did but hundreds of power stations today use this fuel for generating electricity and all the carbon dioxide emitted by these power plants is thrown directly into the atmosphere. Further, there are close to a billion vehicles like cars, trucks, scooters, motorcycles, auto-rickshaws, etc. and all of them emit obnoxious exhaust fumes containing gases harmful to the atmosphere. This happens every single day. Thanks to all this massive emission of fumes, the heat coming from the Sun is trapped by the carbon dioxide in the atmospheric layer surrounding the earth like an onion-skin. When the carbon dioxide burden of the earth’s atmosphere was low, the heat radiated by the surface of the earth could easily escape back into space, but if this heat is trapped as is in fact happening now, then the temperature of the planet would go up and all kinds of terrible things can happen. Some years ago, all the leading nations met in Kyoto, Japan to discuss global warming. They then decided that it would be most desirable to bring down emission of carbon dioxide immediately. 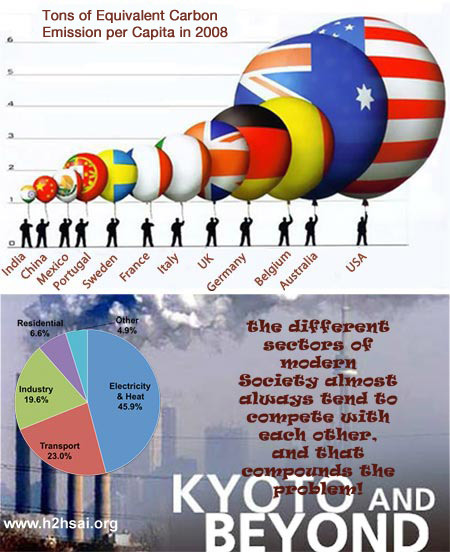 A protocol named the Kyoto Protocol was drafted and all countries were asked to ratify it. Most countries did but a few who contributed the most to the carbon dioxide burden of our atmosphere, did not wish to. Why? Because if they did, it would mean they would have to consume less oil, produce less electrical energy, drive fewer cars and make new cars far more fuel efficient, stop selling coal, and do all that it takes to fulfil a moral commitment to living more environmentally responsible lives. China and India pointed out that all these days, it was the rich countries that did all the polluting and just when the two of them are starting off their economic flights, the big bullies on the world stage want them to apply the brakes on development while they choose to remain deafeningly silent about their own increased consumption. God forbid if anyone suggested any ceiling on their runaway desires and need for unbridled energy consumption! So on the debate goes. At present, the different sectors of modern society almost always tend to compete with each other, and that compounds the problem. In short, at some point the analogy between society and a healthy human body seems to break down. Instead, we have a good comparison with a sick human body, rather than a sound body! “Listen Dear One, the problem with today’s society is not its complexity or having many sectors. Complexity is inevitable in a large Society; after all, the human body indeed has so much complexity and diversity. The issue is the unhealthy and selfish competition between the different sectors. Just look at the human body. If you have malaria and the doctor gives a bitter medicine, does the tongue say ‘Yuk, this is horrible! Why do I have to put up with this bitter stuff?’ and spit the medicine out? Or when there is severe congestion in the lungs and the doctor wants to give an injection, does the arm say, ‘Why should I take the prick? Let the doctor give the injection directly to the lungs!’ and things like that? No! In the human body, the cells, the organs and the different sub-systems as well as systems may perform different functions but they work in perfect harmony, do they not? Swami does not put it quite that way, but I have done so in order to drive home the point. If you have followed carefully what I have just said, you would immediately realise that the Operating System governing the healthy human body is based entirely on the principle underlying the Trusteeship model I am advocating. People with wealth would not say, “Let me use this to make more and more money for myself”. Instead, they would think of finding ways of using their wealth for common good. As recently as about a hundred years ago, many in America, yes America, actually thought this way. There was for example, Andrew Carnegie whose family came to America from Scotland. 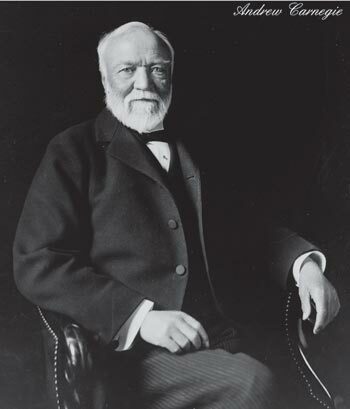 Carnegie entered the steel business; that was the time when America was developing very fast and needed millions of tons of steel for construction, for the auto industry, and other sectors. Andrew Carnegie was a tough businessman and gave his competitors a tough time, making tons of money along the way. But in the end he said, “I am going to leave as much of this money as possible back into the society. It was this country that enabled me to become rich, and I am now going to pay back. My children can find their own way to work hard and make money. This country offers plenty of opportunities for that.” So saying, Andrew Carnegie worked hard to give away the wealth he had earned and in the process he benefited education. Today, the Carnegie-Mellon University in Pittsburgh owes much to him. He also funded the famous Carnegie Hall in New York among other landmark philanthropic work that he initiated. 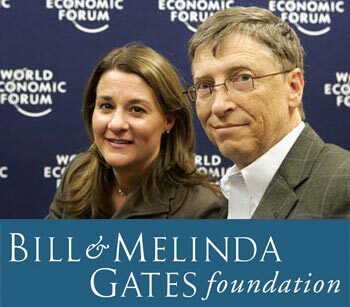 More recently, through the Gates Foundation, Melinda and Bill Gates are not only giving away billions of dollars but also articulating all the time the debt we owe to society, something that Swami frequently reminds His students about. In fact, there are many such people in America and to their eternal credit one must say that many of them give away anonymously, which is often rare with donors. The Trusteeship idea is neither new nor unknown. Not so long ago when the slogan GREED IS GOOD was unknown, people shared far more than they care to do these days. On the other hand today people are not willing even to share a bit of their time. The story is told that when Mother Teresa once went to the United States to receive an honourary Ph. D degree from the Harvard University, she talked about poverty being present everywhere, including in America despite it being the richest country in the world. “May be there is no poverty of money here but I can see there is much poverty of Love!” She said. The Trusteeship idea revolves almost entirely around caring and sharing. Here every individual thinks his life is for doing God’s work using, all the time, the talents and wealth he has, for a higher purpose. How does one do God’s work? By working for society; one sees God in society and then gives as much of oneself for the sake of society as possible, each according to his or her capacity. The capital required for this is not money but the spirit of compassion, love and sacrifice. Today’s media hardly bothers to narrate touching stories relating to compassion and sacrifice but in reality, there are many, some of which we try to disseminate through H2H. Still, a torrent of Love is yet to make headline news. If that is somehow unleashed, then the problems of humanity would be simply swept away like a huge tsunami sweeping everything ahead of it. Only, in this case, at the end of it, there would be peace and joy everywhere, instead of misery, death and destruction. In a society where the feelings of Trusteeship are well-entrenched, pharmaceutical companies would not be shy of developing drugs and vaccines needed for poor people; drugs that are available in the market would not be prohibitively expensive and the manufacture of their less expensive generic forms would not be blocked by so-called patent laws, which I believe are highly immoral, though they might be held to be legal by selfish societies. Education would not be a commercial commodity commanding obscene prices and available only to the very rich or those who are prepared to borrow recklessly; In short, it would be Rama Rajya. Literally translated, Rama Rajya means rule of Lord Rama but what it really means is a society in which there is not merely rule of man-made laws but Moral Law.Mahatma Gandhi often spoke about it. In Rama Rajya, people would not be corrupt, not because of the law or fear of punishment, but because corrupt behaviour would hurt God. In other words, Rama Rajya would be the natural consequence of love for God, fear of sin and a climate of morality in society that Swami often talks about. The individual, whom Swami refers to as vyashti, is a part of society, which Swami refers to as samashti. Society in turn is a part of nature called srishti by Swami and srishti of course owes its existence to God or parameshti. Swami adds that human beings must so act that their actions do not harm society and nor go against Nature. It is only such actions that would be pleasing to God. In the Gita, Krishna briefly touches upon humanity’s Cosmic Origin and his Cosmic Nature as well as his Cosmic Connection, adding that it is our duty as human beings to maintain and preserve this cosmic linkage in all its aspects. These days people do not care about such connections any more. They are most self-centred and care only about themselves. They want society so that they can feed from it and prey on it, but when it comes to paying off their debt to society, it is a case of what has society done for me? It is here that visionaries like Andrew Carnegie and Melinda and Bill Gates ought to be admired. Their heart is in the right place and their priorities socially responsible. 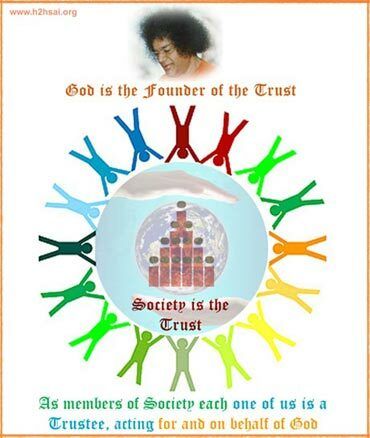 As Swami frequently reminds His students that we are what we are because of Society and therefore owe it a lot. We must discharge our debts to society, Nature and God in appropriate ways. 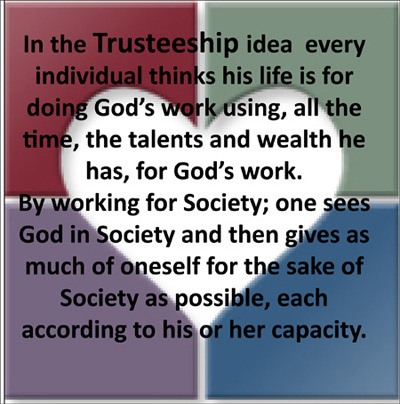 The Trusteeship principle enables just that. When everyone lives for the others seeing the so-called others as part of their own larger Cosmic Self, then external differences disappear. Man is torn between his lower self that relates him to the external world and his inner or higher self that links him to God. If the lower self dominates and wins, then there are problems galore. The stress is on differentiation, with people tending to view themselves as different at all possible levels. In the family, it is father against son, brother against brother, husband against wife. Amongst the tribes, it is one tribe against another. In the community, it is one sector against another. In the market place, it is one company against another. In politics it is one party against another, and in the process, the whole of humanity trying hard to come apart at the seam in every possible way. As a result our society has reached a boiling point. If you have seen water boiling, you would have noticed that there is a turbulent state - bubbles form, some of them join to become bigger, but inevitably all of them are short-lived. Today, the different sectors, be they ethnic, religious, commercial, racial or whatever, are trying to form bubbles of security based on narrow considerations of self-interest. This security is illusory and always short-lived. So what is the alternative? 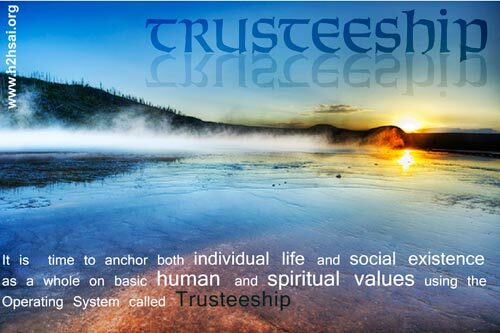 Trusteeship! We are not trying to over-simplify the issue as we are well aware of the many well-intentioned efforts made by the UN and its various bodies, the NGOs of all hues already in place. In the year 2000, top leaders of the world met in New York to come up with the Millennium Declaration but at the end, all such efforts invariably come to naught. Ever wondered why? Most of our problems are created by the head and it is futile to try to solve them using the head, which is what mankind always tries to do. 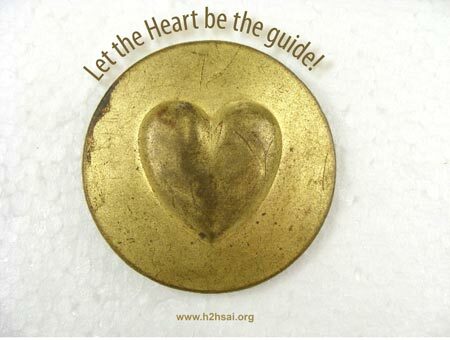 Alternatively, why not allow the heart to be the guide for a change! It is the very nature of the head to seek to differentiate and when differences are stressed, conflict is inevitable. The heart, on the other hand, sees unity underlying diversity, and when that happens, we see ourselves as parts of a whole, in fact a cosmic whole. The individual no longer sees himself or herself as an individual, but rather as a part of society even as the cell merges its individual identity for the common cause of sustaining the entire body. There are two important angles to letting our lives be dictated by the heart. As individuals – though at the level of the Atma or the universal soul, we all are one, at the level of the body we are different – each of us owes a responsibility to society. This is like the cell of the human body doing its job with respect to the needs of the body. For its part, society too has an obligation to its component units, namely the individuals. In today’s society, which essentially has been hijacked by vested interests in almost all communities and countries, macro society exists only in name, catering in practice to vested interests who manage to get their job done using lobby power. It is as a result of this that education has become a commodity, that people are lured into over-eating and become obese, etc. As for medicine, its costs are generally so high that the element of compassion has more or less vanished from the medical profession. In Rama Rajya, things would be different because there, society would care for its citizens, the individuals would scrupulously follow dharma. To demonstrate through personal example how society would care for its citizens in Rama Rajya, Swami has set up a University that offers free and value-based education, hospitals that offer even tertiary care totally free to one and all, and drinking water systems that cater to about ten million people. Swami says that when the Lord came as Rama, He not only demonstrated how the individuals must sustain dharma, but as Emperor Rama He also set norms for how the State must care for its people. The same two lessons, one at the micro level and the other at the macro level are now being imparted by Swami to us all the time. In summary, thus far, humanity has moved forward largely on the basis of sheer worldly intelligence. While this has enabled us to take giant leaps forward in terms of greater creature conveniences, it has also landed us in a huge mess. It is time to move over from the era of sheer brainpower and intelligence to the era of the heart. That means anchoring both individual life and social existence as a whole on basic human and spiritual values. And the Operating System that we refer to as Trusteeship is a convenient way of doing that.